I'd like to point out that many, but not all, of these items fit into a healthier lifestyle. Most items, not including the Red Velvet Bingles, also will work if you are counting Points! 1 Red seedles grapes, 1.75 lb. Saved 69% on some pantry stockers at Publix! I Saved 69% at Publix last week. It was a good week for stocking the pantry. My pantry and freezer are pretty full now, but I hope I can make some room for the great sales this week! I am good for at least 2 months on groceries except for fresh fruits and veggies. Gotta love SouthernSavers.com for helping me find the best deals. 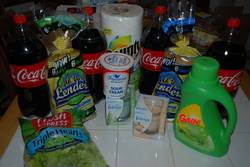 Photos of these great bargains will be on my blog, Coupon Stew, tomorrow! I also did a baby food run for my cousin. I got 21 jars of organic baby food for 35¢ each. I was told this was a good deal, but I don't have any experience purchasing baby food. 8 Pulbix Seltzers PLUS for 57 CENTS!!! I ordered a case of Publix Seltzer water a couple of weeks ago and was MORE than happy to pay 79¢ per 2-liter for them because they are wonderful and waaaaay cheaper than the Perrier and La Croix, which I heart. Then I started looking at my coupons and seeing some overages, so my goal became getting my Seltzers for free. So when they called me this weekend to let me know my case was waiting for me I was ready for a deal!! It wasn't a big ticket trip, my goal really was to get out of there close to free with my sodas. For starters they were on sale this week for 50¢ each, so that was a great start. Then I had a coupon for a Febreze Scented Oil Warmer that gave me a 50¢ overage. Sundown Vitamins were on sale and when I stacked a manufacturer coupon and store coupon I had a $5 overage!!!! I've heard that Publix will give you your overage, but I don't think that mine in Vestavia will do that, so I made sure to get enough to cover my overage. My goal was free, but 57¢ is pretty darned close for what I got. Especially since I was more than prepared to spend $6.32 for my seltzers only! 2 1oz. Trial size Flavored Craisins, blueberry and pomegranate-- yummy!! Like I said, not a big trip but all of this for 57¢ is pretty darned good!! Small trip. Saved 76% at Publix. I put the groceries away before I posted. Thought about pulling them back out, but then I decided a list would be good enough this week! 1 Green Tobasco sauce, 5 oz. $115.35 Total $42.80Spent $72.55 Saved 63% Discount!! 5 Mott's Medley 46 oz. My starting point is always Southern Savers. Check out her site. You'll get a lot of great ideas and great deals! I heart saving money. I am going to post some of my good deals here. I almost always find them at SoutherSavers.com, although I'm getting pretty good and finding them myself now. Feel free to comment and let me know what you think!! throws metal with mittens on in the dead of winter listening to the cold as it echoes down the streets and into her bones. consecrated to the Sacred Heart of Jesus, navigating these streets and figuring out this GPS, and trying real hard to reach Sainthood. failing miserably every day. trying again every tomorrow.